This run was different to any other ultra I’ve ever done in so many different ways and taught me some valuable lessons on mental approach of big challenges, defining success and teamwork. 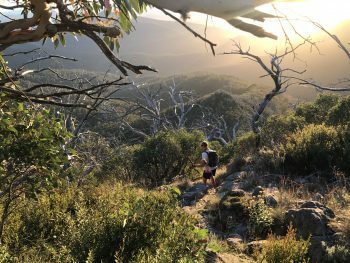 How it came to be that a group of not just 2, but 10, Mountain Goat Trail runners, made their way down from Sunny Brisbane to Australia’s allegedly toughest Ultra Marathon, held in the Victorian Alps and covering a total distance of 100km and with a huge 5600m of elevation? The answer probably lies in a mixture of FOMO, enthusiasm and the love of a challenge. The more I read and heard about it the more the epic proportions of it dawned on me. 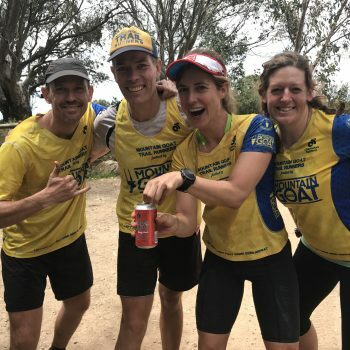 A race through an area so remote, us mortals are only allowed to do it in teams and despite finishing UTA100 in 16 hours, there was a serious chance of missing cut offs and spending a night out on the course. Those meant all team members were required to run with a sleeping bag and a camping mat as part of our mandatory gear. Game on! After countless (and always less than you think you needed) training runs & adventures with the goats or from the Squadrun program it was H2H weekend! Finally – the most stressful part of an Ultra for me is the lead up and the mental preparation. Love it when you’re at the start line and the gun goes off, no more second guessing, just go, give it everything and deal with issues as they arise. This race required a different strategy than most because of the team aspect and the prospect of not making cut offs. We nailed the team Strategy; I couldn’t have wished for a better teamie than Downhill Danni! With her can do & fun attitude, mental and physical strength and a killer downhill speed that helped me push my own boundaries. Get stuck at Gantner or Speculation CP in which case this race would turn into even more of an adventure- winning again! In short however it worked out we were winning! 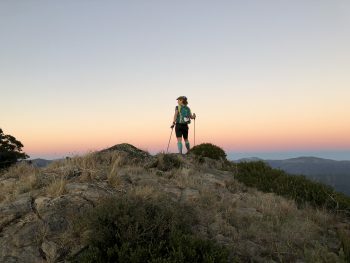 Then finally the start gun went off and a trail of headlamps headed for the top of mount Buller. Because we were fiddling with our poles we were quite a bit behind on the rest of the Goats, but we were in it for the long game not the fast game and planned on slowly catching people later in the race. 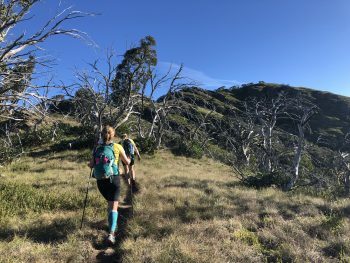 After summiting Buller, it was time to do down the dreaded 4-mile spur 1250m downhill over 7 km. The volunteers had done an amazing job clearing the track and it wasn’t as bad as I feared and even managed to run the later sections, inspired by Down Hill Danni. It was great however in training I hadn’t given my quads enough of a downhill hazing and the latter section of the first day my quads were gone. Before we knew it, we hit Howqua River crossing; so good to feel the cold water on your feet as we waded through the river. This was followed by a beautiful section along the river where we caught up with another Goat team and shared some nice trail time with them before we hit the 8-mile spur. A very serious uphill section where my calves regularly thanked the 2.5-hour stair repeats that had been part of my training program. It was a long slow slog up and all I can say is “Hooray for Poles”. As we reached the top of the Bluff the views were starting to come through, however by no means did this meant we were at Lovicks yet… and the cut off time was getting closer. Originally, we had anticipated to have a least an hour spare at the cut off but as we kept grinding the minutes kept ticking away… and it looked like we’d have less than half an hour to spare should we continue. Instead of stressing during the run we decided to assess the actual situation at the aid station. A great strategy because at Lovicks we saw a flash of a yellow shirts: GOATS! Pete and Jon were at the CP 20 mins ahead of us and just about to leave. We decided to try and catch up with them as soon as we had taken care of ourselves: Apply tape against chaffing, eat stroopwafels and peanutbutter sandwiches, apply sunscreen and I was wondering if I should do something about what felt like the start of a blister under my big toe. Coaches advice rang through my head… always deal with niggles straight up and I was happy I did. Because of the water crossing my feet turned into granny feet and this created hot zones on my feet. Luckily, I had dry socks and Vaseline in my drop bag which took care of it. Onward we killed the next cut off and our long game strategy was starting to pay off as we were overtaking people along the stunning ridgeline. Amazing part of the country but we had our eyes set on the making the next cut-off at 5pm at the Gantner hut. Distance wise we figured we should be able to make it and we started pushing harder. We were reunited with J&P and told them to tag on to us so we would all make the cut! Then we saw something we had hoped not to see Kylie Emerson (ultra-athlete and sweep) overtook us but told us we could make it if we pushed for it. Which we did and came into the CP 3 minutes past the cut off… we got the honour of being the first guests of the night for the Gantner hut. Gantner hut and its amazing group of volunteers were just the best and made us feel very welcome. It almost felt like glamping with a toilet with an amazing view, campfire, endless supplies of soup and one-minute noodles and even candle lit massages. They have a special place in our hearts. Since we were done running by 5Pm we had some time to put our ultra-brain concocted plan together about a pole dancing video in praise of our poles. A stunning backdrop, supple moves and lots of laughs lead to an epic creation of a video…. Not to be shared though! After a night’s sleep is was time to say goodbye to our new friends and hit the trails for part 2 of the adventure. We formed a Goat squad with Jon and Pete and set off for crosscut saw ridge. 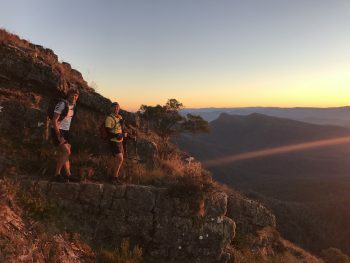 Here we were spectators to the most spectacular sunrise we’d seen in ages and this moment of magic set the tone for the rest of the day where we enjoyed highs and lows, spectacular vistas, good conversations and the sense of being part of something bigger. What definitely contributed to the latter were all the amazing volunteers we met along the way! Like the volunteers from the Kings valley hut who made the best vegemite chips sandwich I’ve ever had and warned us of the creek to come so I waited with my sock change till after. The volunteers Mansfield Austim group who, when they found out we were mountain goat gave us a Mountain Goat beer to share for further encouragement. That went down a treat! 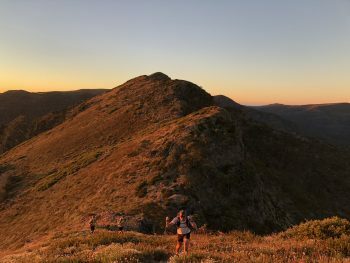 With our extended team we reached mount Buller where Simo, our photographer goat was waiting for us ready to take some of the most amazing race photos’ that captured our team spirit and the essence of the race better than any words I could ever put to it. The feeling of crossing the finish line was amazing, I felt so grateful for having been part of this special event and having been able to share it with some very special other human beings. Train with your full backpack, this will help prevent sore shoulders on race day and one less thing to suffer from. Be dressed for the weather- we were lucky but with rain and cold I would not have been adequately prepared. A lot of the terrain wasn’t runnable which means your fuelling strategy is different. Because I wasn’t running I was less hungry and probably didn’t eat enough. You can eat more solid food if you’re hiking which is a good thing to keep in mind. Take the full 3 days off a) to fully enjoy it and not rush and b) logistics for this event are massive so logically not all drop bags were back by the end of the second day. This entry was tagged multiday, Oscars 100 Hut2Hut, ultramarathon. Bookmark the permalink.